CALLUM Mills has taken another significant step towards a permanent move to the midfield with a dominant performance in Sydney's modified scratch match on Friday. Mills has played predominantly as a defender in his 55-game career so far but has trained as an onballer over summer after recovering from last year's serious foot injury, which saw him play just nine games. The Swans have been cautious about placing too many expectations on their young star, but his form might force a change to their thinking about making his change of role a gradual one. He started the game in the centre square with George Hewett as an opponent and won the footy at will in the first half, showing his usual poise and toughness under pressure, and rarely wasted a possession. The 21-year-old also spent time on co-captain Luke Parker and combined brilliantly with fellow Academy graduate Isaac Heeney, with Mills adding a couple of goals to his ball-winning before half-time. Parker was another standout performer with the new skipper's trademark ferocity at the footy on show, and both he and Mills also spent time resting inside 50 where their marking ability can be best utilized. Small forward Tom Papley was a strong performer for the second week running, with his midfield minutes also set to increase in 2019, along with off-season recruit Ryan Clarke who found plenty of footy on the wing. Former Cat Jackson Thurlow was used in defence and took the kick-ins for one of the teams, and he combined well with Heath Grundy especially deep in defence, with Grundy given the task of minding Sam Reid out of the goal square. Young key position prospect Tom McCartin continued his strong pre-season and booted two goals in the first half opposed to Jack Maibaum, before he was moved into defence to play on Reid and did a solid job after half-time. Forward Jordan Dawson did some handy things playing through the midfield, with draftees Justin McInerney and Zac Foot showing some exciting signs playing on opposite wings, with Foot's leg speed and McInerney's competitiveness notable. Co-captain Josh Kennedy participated in the second half, with Aliir Aliir, Harry Cunningham and Lewis Melican also coming on after the main break. 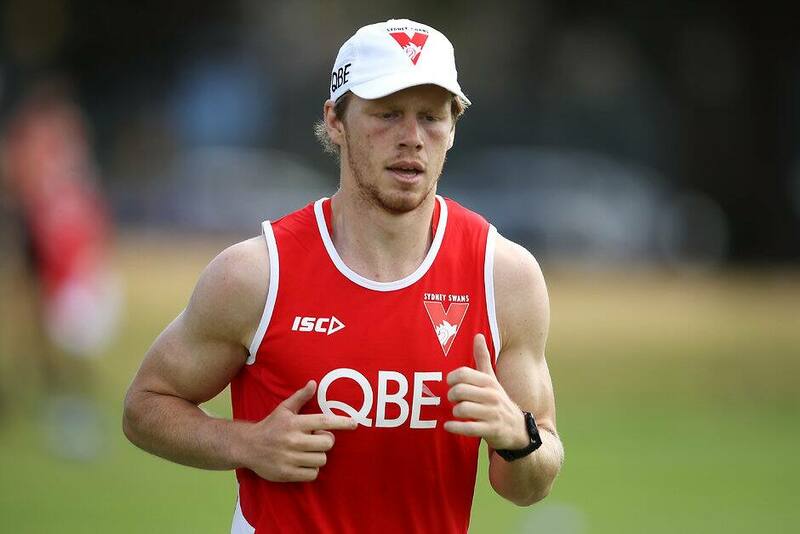 The Swans had a host of big names looking on in warm conditions, with Lance Franklin, Jarrad McVeigh, Jake Lloyd, Will Hayward, Oliver Florent, Nick Smith, Kieren Jack, Sam Naismith, Dan Menzel and highly rated draftee Nick Blakey among those not to play in the hit-out. Most of those players took part in the skills section of the three-hour session, and did a power of running away from the main group, as well as circuit training and boxing.